The following is a supplemental Bible study guide to the sermon of the same name that can be found by following this link. David, the king of Israel, begins his day by asking if there is anyone that he may demonstrate kindness to. David is not simply motivated to do this because he is a nice guy. He is motivated by a covenant that he had made with Jonathan, the son of the former king, Saul. At this point in the narrative, Saul and Jonathan have already died. When Jonathan was alive, however, he and David were the best of friends, and both men loved each other as brothers. In fact, when Jonathan instructs David concerning the details of the covenant (I Samuel 20:15) that David makes with him, he uses the word lovingkindness, a near identical term to what David says here in II Samuel. Hence, David seeks someone to whom he may show kindness for the sake of a promise he made to someone else. 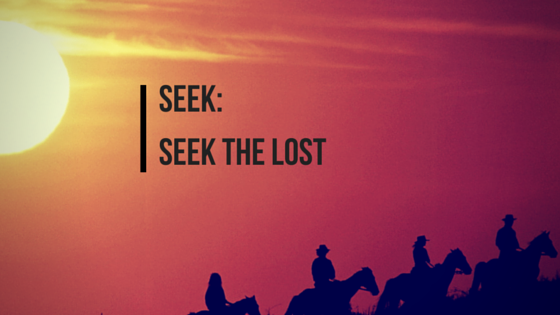 Similarly, Jesus expressed His own divine mission statement in Luke 19:10 when he declared that He came to “seek and to save that which was lost.” Salvation is of The Lord, and only He can save. Just like king David, however, we are very capable of seeking. This means being proactive about striving after those who are lost—those who do not yet know Jesus. We may not have figurative Jonathans in our lives, but we can look back and remember what God had already done for us, notably what Jesus did for us on the Cross. The only reason any Christian is “found” is because God first sought us. And because of His kindness, we are now motivated to seek the lost. Christ fulfills three offices: prophet, priest, and king. As prophet, Jesus speaks on behalf of the Father and proclaims the Word of God so that we may know the truth. As priest, He acts as a mediator or an intercessor between the Father and us so that we may develop a deep, personal relationship with God. As king, He is sovereign and rules over us, protecting us, leading us, and incorporating us into His kingdom. To seek is a function of the prophetic office as we strive to find those who do not know God and make an introduction. As seekers, we speak the truth of God’s Word to others. Reaching is a function of the priestly office. In order to establish and maintain a lasting relationship, we can never expect the world to meet us where we are. We have to meet them where they are. Today, whether we’re talking about marriage, parenting, counseling, or relating to friends, the priest seeks to empathize and relate to people based on their context. The reason for this is obvious: people have tremendous experience living their lives but no experience living someone else’s. Realize that reaching people where they are does not mean idolatrous accommodation or a manufactured sense of inclusiveness where anything goes. Reaching them means bridging a gap and relating the objective, external truth of Jesus to their subjective, internal experience. Reaching them means making things simple, plain, and relatable to everyday life. 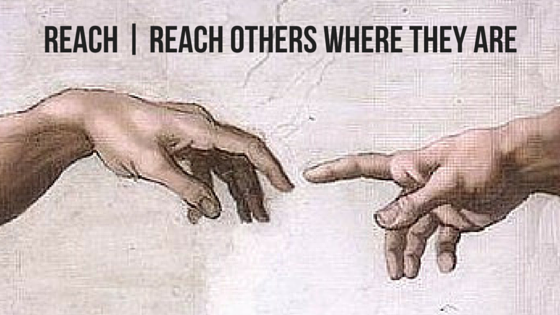 Reaching them means telling stories that will inspire them to act. So you may have three degrees in theology, but can you explain atonement to a six year old? You may have been in church before she was born, but do you know what to say when she feels broken and vulnerable? Praying for two hours a day may be normal for you, but can you lead and guide a brand new believer who has a hard time praying for two minutes? David is a king, and he was used to having circumstances bend to accommodate him. Yet in spite of this, he actively reaches for Mephibosheth, a person who was living on the margins. Mephibosheth was the grandson of a former king of Israel, yet he was now living in a place across the Jordan river, outside of Israel. Mephibosheth was literally outcast, crippled in both feet (for how this happened, see II Samuel 4:4), and had no one reached out to him, he would have lived a life in obscurity, away from his rightful inheritance. God reached us where we are by taking the form of a human being (Jesus). Here, David reaches Mephibosheth where he is—in a place of no association, no communication, and on the sidelines—in order to restore a severed relationship. To restore is a function of the kingly office. Kings always rule over kingdoms, and kingdoms function best when people have a common purpose, a common assurance, and a common agreement that they will be able to accomplish much, much more together than if they were apart. Again, David didn’t have to do anything for Mephibosheth. He didn’t have to restore the proper inheritance to someone who thought of himself as so lowly that he referred to himself as a “dead dog.” Similarly, God didn’t have to anything for us. He didn’t have to rescue us from our depravity, He didn’t have to sacrifice Himself to pay the penalty for sin, and He didn’t have to provide a means for salvation. But, because of the kindness of God, He did do all these things so that His invisible kingdom can be made visible. The call to restore others means seeking for and reaching out to the many figurative Mephibosheths who live in places outside of our normal scope of vision¾people who have royal blood in their veins but who have forgotten that their grandfather was a king and who now consider themselves “dead dogs.” Realizing that in the Bible, separation exists only but for a season, restoration means all the pettiness and bitterness of the past deprives the kingdom of its full potential. 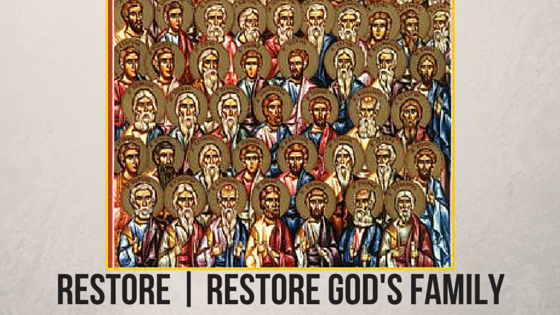 Restoration is characterized by zealous men and women working together to seek, reach, and restore Mephibosheths. Restoration involves a recognition that no human being knows whom God has chosen and elected, and therefore, many of the people who may be regarded as “lowly” or “unworthy” are in fact lost members of God’s family who have a reserved seat at His divine table. Restoration involves us going out and demonstrating kindness to others and acknowledging their place at God’s table.